These stylish carriers enable you to carry your dog comfortably and in style. The check waxed fabric with cotton lining gives it a chic look. There is a pocket on the side for goodies and pooh bags. There is hook inside to attach to your dog collar for extra security. 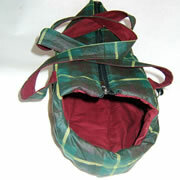 The bag is great for puppies and small dogs less than 5kg.